Lucky bamboo (Dracaena braunii) is often mistaken for being part of the bamboo family. The plant is unrelated to Bamboo and not native to Asia. It is found Nativity in Cameroon and the tropical west Africa. It is part of a small group of small shrubby species with slender stems and flexible strap-shaped leaves that grow as under-story plants in rain forests. 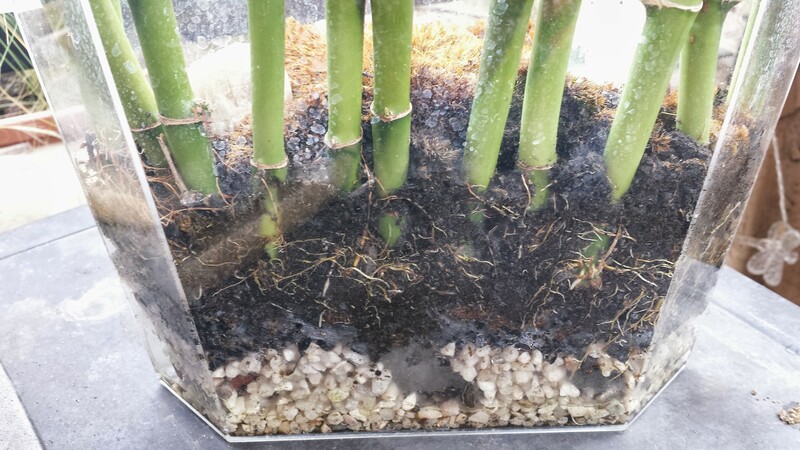 Lucky bamboo grows better in soil, although it is often sold with the roots in water. The plant does best in bright indirect lighting with temperature between 59 to 77 degrees Fahrenheit. 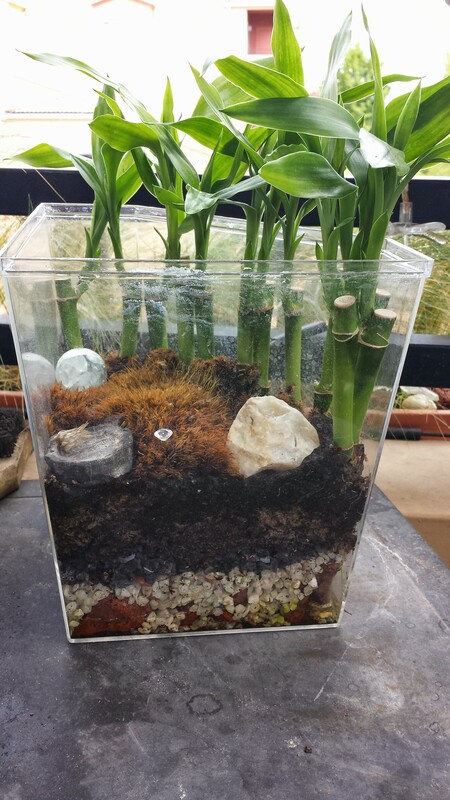 It can be submerged and used as an aquatic plant, but it will only last a few months before it rots, unless the sprouts are allowed to grow above the surface. 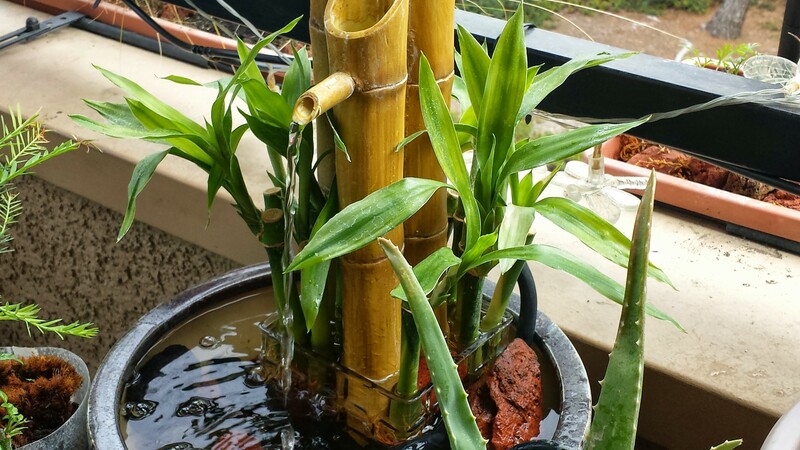 Keeping lucky bamboo inside house and business places is believed to bring happiness and prosperity and this belief has promoted a huge sales of lucky bamboo shoots grown in decorative pots. In India, the plants are usually imported from China and Taiwan and resold in attractive pots and the plant has become most popular indoor plant in certain parts of India. It has been a few months since I purchased some of this plant with the idea of including them in a terrarium. 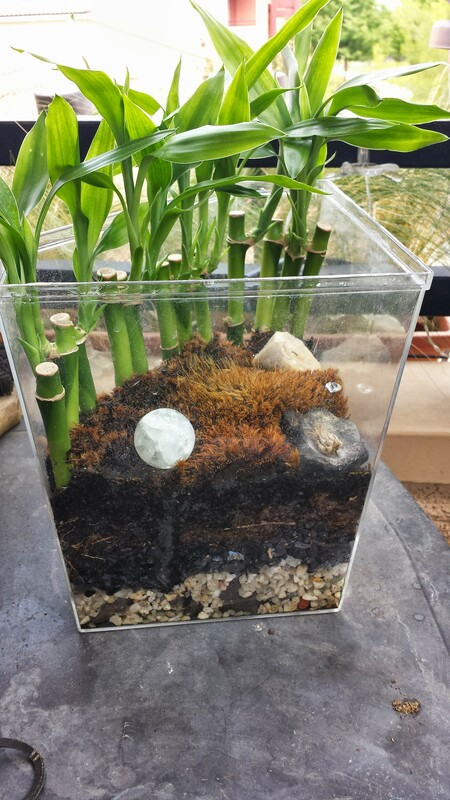 About half the plants I purchased went into the terrarium, with some moss. The other half I decided to display in a fountain. This fountain gets cleaned and maintained about monthly. And I do nothing special to the water I put in it, except let it sit for 24 hours in a gallon jug to help remove the chlorine and fluorine in the water. I do not know if the local water uses chloramine, which has a longer life than chlorine. It has been 3 months since I wrote this post. The lucky bamboo has done very well. Both the few that are in the fountain, just in water, and the few I have in a terrarium. They are out on the deck and seem to be prospering. In the last few days I have had temperatures low enough to freeze some of the water in the fountain. The ice has formed during the overnight, and in some cases has also formed on the leaves where the water is splashing. I have seen no adverse reaction from the plants. The lowest temp was last night at 28 degrees Fahrenheit. The night before last was 30 degrees. I will be paying attention to the temperatures and the reactions of the plants.